"We cannot continue to produce food in the same way we have...(we) need to shift to a more holistic approach on sustainability," said José Graziano da Silva, Director-General of the Food and Agriculture Organization. Da Silva discussed the issue during the launch of the publication, Sustainable Food and Agriculture: An Integrated Approach, which aims to show state-of-the-art evidence on how sustainable agriculture can be continuously improved at different scales. It highlights the importance of getting policy frameworks right to address the challenges brought about by climate change as well as the growing population. He stressed that the only way to move forward in such direction is to revise policies and guidance. According to FAO, the book is the first one to look at the imminent threats to sustainable food security through a cross-sectoral lens, with inputs from 78 experts from various universities and organizations around the world. Elizabeth Ainsworth was awarded by the National Academy of Science's Prize in Food and Agriculture Sciences. A molecular biologist in the U.S. Department of Agriculture (USDA) Agricultural Research Service (ARS), Ainsworth was recognized for her scientific work that showed the effects of increased levels of ozone and atmospheric carbon dioxide, drought, and other environmental problems to crops such as maize and soybeans. Her work not only focuses on these problems, but also involves identifying key mechanisms by which plants respond to specific elements of climate change, resulting in maximum potential crop production. ARS is the USDA's main scientific in-house research agency that focuses on solutions to agricultural problems affecting America. The NAS Prize in Food and Agriculture Sciences Award are given to individuals in America who has made an extraordinary contribution to agriculture. Find out more in USDA ARS. 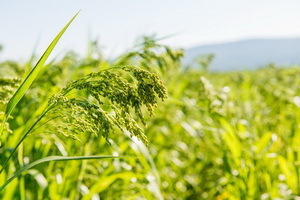 A research team led by Dr. Zhang Heng and Dr. Zhu Jiankang from Shanghai Center for Plant Stress Biology of Chinese Academy of Sciences has sequenced the genome of broomcorn millet. Broomcorn millet is the most water-efficient cereal and one of the earliest domesticated plants. The genome sequence provides the foundation for studying the exceptional stress tolerance as well as C4 biology in broomcorn millet. The researchers report the high-quality, chromosome-scale genome assembly using a combination of short-read sequencing, single-molecule real-time sequencing, Hi-C, and a high-density genetic map. Phylogenetic analyses reveal two sets of homologous chromosomes that may have merged ~5.6 million years ago, both of which exhibit strong synteny with other grass species. The researchers report that broomcorn millet contains 55,930 protein-coding genes and 339 microRNA genes. The research group found that enhanced regulation of protein dynamics may have contributed to the evolution of broomcorn millet. In addition, they identified the coexistence of all three C4 subtypes of carbon fixation candidate genes. The genome sequence is a valuable resource for breeders and will provide the foundation for studying the exceptional stress tolerance as well as C4 biology. For more details, read the research news from the Chinese Academy of Sciences. Researchers have successfully assembled a near-complete genome sequence of the popular plant model system Antirrhinum majus, commonly known as snapdragon. The near-complete assembly is comprised of 510 megabases of genomic sequence and contains nearly 38,000 annotated protein-encoding genes. The research was done by scientists in China and at the John Innes Centre (JIC). Snapdragon, a flowering plant, has served as a model system for the past three decades, facilitating investigations into molecular and developmental genetics. Antirrhinum has been used as a model system by scientists in learning more about plant shape, gene function and important genetic elements such as transposons – also known as jumping genes. For more details, read the press release from JIC. Research groups from Heinrich Heine University Düsseldorf (HHU) and the University of Münster (WWU) have discovered a new switch that plants use to control their responses to iron deficiency. Iron regulation is an important model system in plant biology for understanding how cellular regulation processes impact on each other and the related signalling paths. The HHU and WWU research teams have examined the special mechanisms and dynamics of a protein named "FIT" in iron uptake and have discovered cellular information processes that impact on FIT. The protein was discovered by Prof. Petra Bauer's group. The regulation mechanisms are being examined at the Institute of Botany at HHU. FIT can be present in an active and inactive state. It plays a key role in regulating iron uptake in Arabidopsis thaliana. How the plant decides how much iron to absorb and how to transmit this information to the FIT regulator is, however, the subject of current research at HHU. The WWU research group looked at calcium signal transduction which involves response to iron deficiency. They then analyzed the iron concentration in the plants. The precise link between iron and calcium was unclear. However, the research groups have found that iron deficiency triggers calcium signals, having a significant influence on the FIT regulation mechanism. They describe how the enzyme CIPK11 linked to calcium detection interacts with and mark the FIT protein. Plants ultimately use this FIT activation to control iron uptake in its roots and iron storage in its seeds. For details, read the research news from HHU. To respond to abiotic stresses, plants have evolved complex molecular, cellular, and physiological mechanisms. In tortula moss (Syntrichia caninervis), ALDH21 gene plays a role in responding to abiotic stresses, and overexpression of this gene in tobacco and cotton improved tolerance to drought and salt stresses. Thus, scientists from the Chinese Academy of Sciences and partners developed transgenic ScALDH21 cotton and tested if it is suitable for cultivating under water deficit conditions. Results showed that overexpression of ScALDH21 in cotton led to higher net photosynthetic rate, less cellular damage, more cellular protective compounds, and enhanced growth compared with non-transgenic cotton under drought stress in managed treatment plots. The yield of the transgenic cotton plants under water deficit conditions was shown to be higher than the yield of non-transgenic cotton in full irrigation conditions. Furthermore, the fiber quality of transgenic cotton was improved. Based on the findings, it was concluded that transgenic ScALDH21 cotton has the potential to improve crop yields in water-limited agricultural production systems. 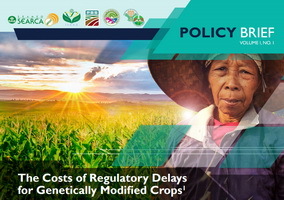 For more details, read the article in Crop Science. Iron-deficiency anemia impacts the immune system of children, causing stunted growth and impared cognitive development. One of the strategies to combat this health problem is the biofortification of staple food through biotechnology tools. Researcher Narayanan Narayanan from Donald Danforth Plant Science Center and colleagues developed biofortified cassava with higher levels of iron as reported in Nature Biotechnology. The research team overexpressed Arabidopsis thaliana vacuolar iron transporter V1T1 in cassava, which led to accumulation of iron in the storage root, and was found to be 3 to 7 times higher than the iron levels in non-transgenic control. Plants engineered to coexpress a mutated A. thaliana iron transporter (IRT1) and A. thaliana ferritin (FER1) accumulated iron levels 7-18 times higher and zinc levels 3-10 times higher than those in non-transgenic plants. There were no significant effects found in the growth parameters and storage root yields. 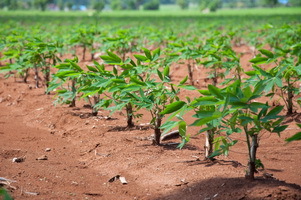 According to the researchers, iron and zinc in processed transgenic cassava (IRT1 + FER1) could provide 40–50% of the estimated average requirement for iron and 60–70% of the estimated average requirement for zinc in 1- to 6-year-old children and nonlactating, nonpregnant West African women. Read the abstract in Nature Biotechnology. Using the gene editing tool CRISPR, a team of scientists at the International Institute of Tropical Agriculture (IITA) has announced that they have developed banana and plantain varieties that are resistant to banana streak virus (BSV). BSV is hampering the crop's production in Africa and threatening the food and income of millions of farmers. For more details, read the IITA News. To keep track of the increasingly large amounts of data from studies conducted using new gene editing tools, researchers at the at the Boyce Thompson Institute (BTI) developed the Plant Genome Editing Database (PGED) to be a central repository for efficiently managing plant mutant data, as well as to provide a platform for sharing the data and mutants with the research community. PGED will help lead to more efficient use of resources by reducing unnecessary duplicate experiments and catalyzing collaborations among research institutions. To help spread the word about the database's creation, the researchers recently published a call for data submission to PGED in the journal Molecular Plant. The database currently contains data generated by BTI's Greg Martin lab on 432 tomato lines created with CRISPR-Cas editing. Martin notes that while CRISPR-Cas-generated lines are the main focus of PGED, it can also be used for plant mutants generated by other genome editing tools like meganucleases, zinc finger nucleases (ZFNs), and transcription activator-like nucleases (TALENs). Read more about PGED in the BTI news release. Researchers have been using the CRISPR-Cas9 system to edit the genomes of important crops such as wheat. Despite the tractability in designing this system, the efficacy of the tool is also dependent on the DNA delivery method. The most common delivery method is biolistics based transformation but due to the high frequency of gene silencing linked with high copy transgenes and low edit rate in wheat, a large population of transgenic plants are needed for recovery of desired mutations. This led Zhengzhi Zhang from the University of Missouri and team to develop an Agrobacterium-delivered CRISPR-Cas9 system in wheat. The reported system includes a wheat codon optimized Cas9 driven by a maize ubiquitin gene promoter and a guide RNA cassette driven by wheat U6 promoters in a single binary vector. Using the system, they have developed 69 edit mutants for four grain-regulatory genes in three generations at an average edit rate of 10% without detecting off-target mutations in the most Cas9-active plants. 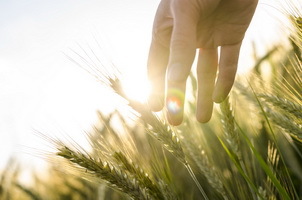 Based on the positive results of the study, it has proven that the Agrobacterium-delivered CRISPR-Cas9 system could be used for wheat genome editing, which only needs a small number of transformation events. Read the research article from the Plant Biotechnology Journal. Scientists from Roslin Technologies in Edinburgh used genetic engineering to develop chickens that lay eggs with drugs for arthritis and some cancers. The drugs are estimated to be 100 times cheaper to produce when laid compared to those manufactured in factories. According to Dr. Lissa Herron, one of the researchers, the chickens do not suffer and are even "pampered" compared to the handling of animals in farms. "As far as the chicken knows, it's just laying a normal egg. It doesn't affect its health in any way, it's just chugging away, laying eggs as normal," she added. The new approach produces better yield and is proven to be more efficient and cost-effective compared to previous attempts. The researchers believe that in time, production can be scaled up to produce medicines for commercial distribution. The workshop will highlight different approaches to the control of invasive species that make use of transgenic and nontransgenic organisms designed for introduction into a target population in order to reduce or eliminate it. The presentations given on these various approaches will compare them with respect to efficacy, biosafety, practicality, cost, and time frame for implementation. To register, visit the ILSI website.